For those who have ever worked in the service industry, what was most annoying? I’ve worked in various restaurants over the years and I still cannot get over the amount of food we discarded. According to the U.S. Environmental Protection Agency (EPA), food scraps are the single biggest contributor to landfill waste, making up around 34% of total volume. While rotting away in the landfill, food scraps emit methane, a greenhouse gas with 21 times the global warming potential of carbon dioxide. Furthermore, wasted food costs American citizens an estimated $100 billion a year. However, many American households experience food insecurity, meaning that their, “consistent access to adequate food is limited by a lack of money and other resources at times during the year” (USDA). We seem to be missing an opportunity: too much food gets wasted, yet many people do not have enough to eat. To address this issue, Philadelphia’s Food Policy Advisory Council (FPAC) Zero Waste Subcommittee hosted a lunch and learn event where representatives from the U.S. EPA, Philadelphia Recycling Office, Philabundance, and Philadelphia Department of Public Health discussed causes, effects, and solutions to the food waste problem. Bennett Compost was also there to pick up any food scraps from lunch. The discussion centered on food producing businesses, and outlined different ways that organic waste can be used safely and productively while being diverted from the landfill. Each organization/agency brought a different perspective to the table, and from that came constructive conversations between the presenters and attendees. 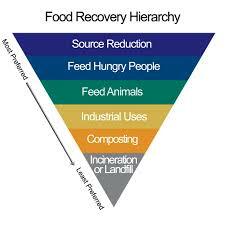 The chart below (from the EPA) outlines the best methods for reducing the amount of food waste entering landfills. During the presentation, Luke Wolfgang from the EPA outlined the great work being done in West Philly through the University City District (UCD) Food Recycling Project. Participating food businesses, including restaurants, grocery stores, and catering companies, donate safe and usable food to local food cupboards and soup kitchens. Additionally, food businesses have a few options for recycling food scraps, depending on volume of waste and storage space. For businesses, the value of donated food is tax deductible, and composting food scraps reduces trash disposal costs, all while helping the community. Residents are encouraged to participate through composting food scraps. 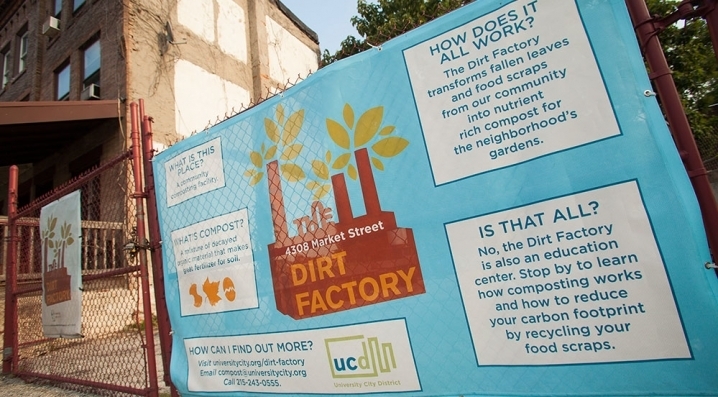 The Dirt Factory, a community composting facility, accepts food scraps for free. Find out more at http://universitycity.org/university-city-food-recycling-project . Categories: Zero Waste | Permalink.